Today marks our 100th blog post!! You can follow one of these recipes, or simply buy a ready made cake. 1. Combine coconut milk and heavy cream in a sauce pan and bring to a boil. 2. In a bowl, mix sugar, cornstarch, and salt. Add in the egg yolks one at a times and whisk thoroughly until everything is combined well. Add in coconut and vanilla extract and mix. 3. Very slowly add in the milk to egg yolks while whisking it together. Put back on stove for another 1-2 minutes. Make sure to keep whisking it. 4. Take off heat and add in the butter. Mix it well. 5. Cover it with plastic wrap, making sure the plastic is touching the top part of the cream. This prevents a skin from forming. Chill for at least 2 hours. 6. Take it out when you are ready to make the trifle. Gently fold in 1 cup of whipped cream. 1. Mix sugar with whipped cream. I buy heavy whipping cream and add sugar and beat it for a few minutes until it turns stiff. 2. Slice the cake and take half of it to layer the bottom of a large serving bowl. 3. 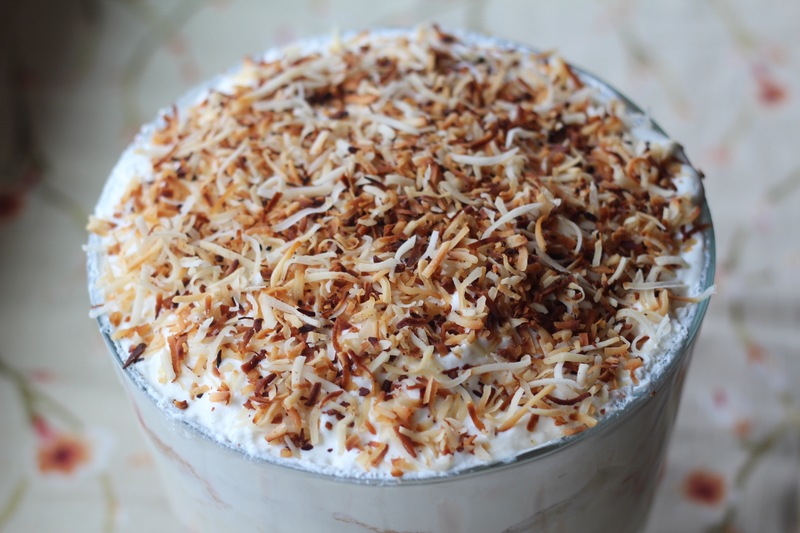 Top it off with half of the pastry cream, half of the whipped cream, and half of the shredded coconut. 4. Repeat steps 1 & 2. It’s OK if it overflows a little! 5. Cover and refrigerate for at least 12-24 hours. 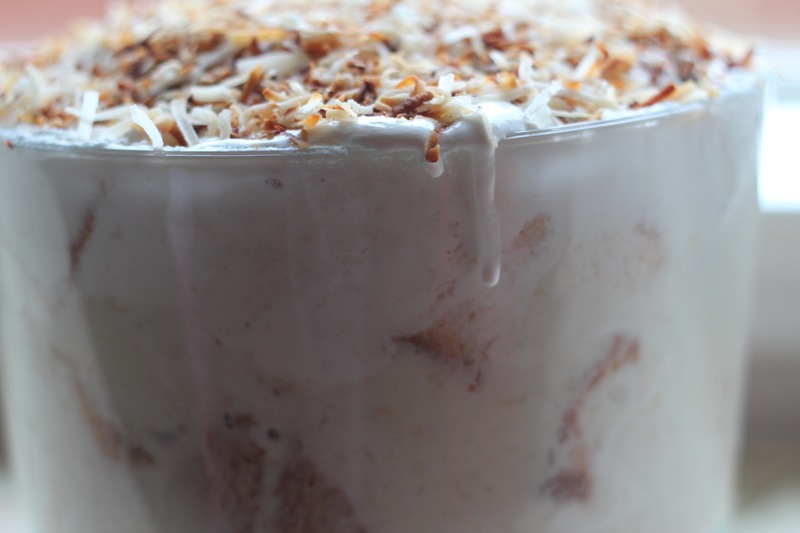 Serve cold and enjoy this insanely delicious dessert!!! aslam U alikum I really like this recipe. I am not into cooking too much and I want to make this for a dinner. what do you think It will be enough for how many people? I am inviting 14 adults and 9 children ages 2-9.should I double the recipe? Wasalaam Sabeen! If this will be the only dessert then I do suggest doubling the recipe just to be on the safe side! 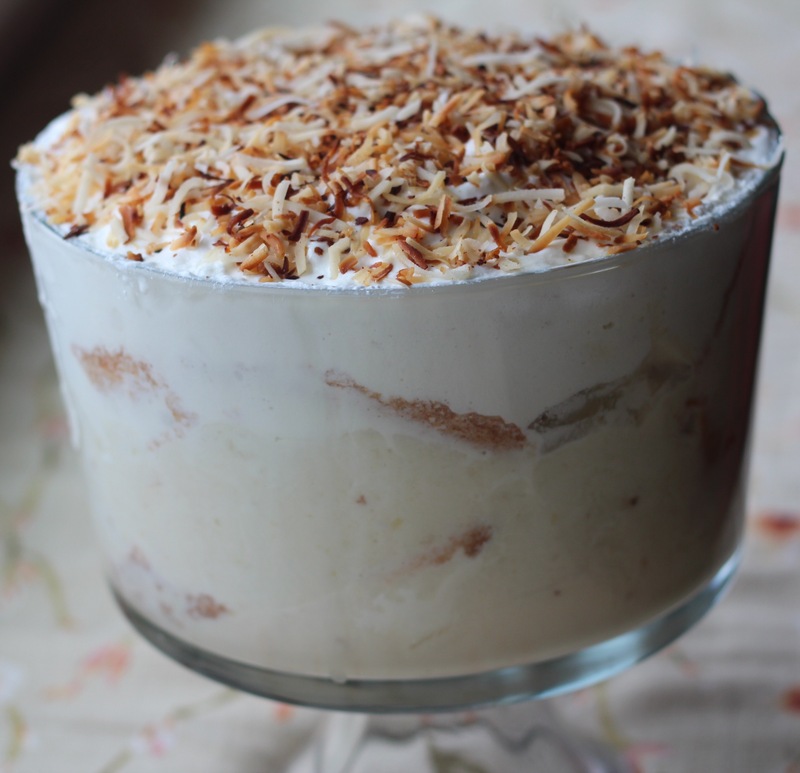 I’ve served this at large dinner parties, but usually have another dessert or two on the side.